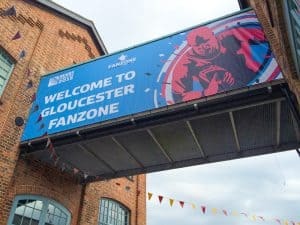 Promotional Banners represent a very cost effective way of adding a big splash of colour and impact wherever there’s a need for eye-catching graphics on a temporary basis. Promotional Banners are easy to transport, and simple for the end-user to install or deploy. Promotional Banners can be made from many different types of material dependent upon the intended size and application of the article. At its very simplest, a banner will be made from a piece of printable plastic material with an eyelet at each of its corners. More elaborate constructions are required if the banner is large or installed in exposed locations. A so-called “scrimmed” vinyl material is very popular for banner manufacture. A “scrim” is a loosely woven reinforcing “fabric” made from polyester fibres and whose manufacture is technically demanding. This scrim will be coated during manufacture with one or more layers of printable plastic in the best constructions. Cheaper constructions are laminated. To produce a large promotional banner from a scrimmed material, the material is first printed in a suitable wide-format inkjet printer. The banner material is somewhat soluble in the ink used and so the result is very durable. After printing, the banner may be subject to hemming using an ultrasonic or heat generating tool and then it will have eyelets installed. Hemming and eyeleting are, together known as finishing. 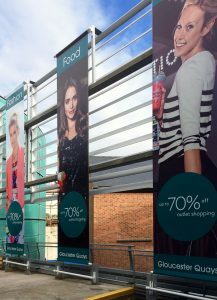 Promotional Banners can also be printed on open weave materials known to those skilled in the art of wide format printing as meshes. It is a common misconception that a mesh material achieves a more favourable wind loading but in fact, weight saving is an equally desirable result imparted when using mesh constructions. 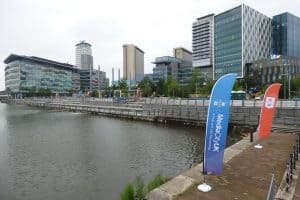 While banners have a very well defined remit in low cost promotion, the promotional banner medium has evolved and overlaps into an area once reserve for higher quality graphics. So-called “pull-up banners” are becoming very popular for their portability, low cost and very high quality print.